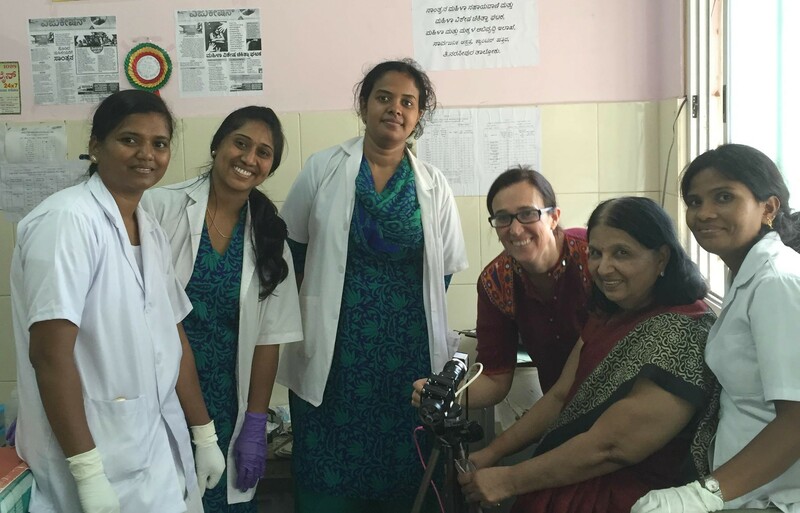 Associate professor Jessica Ramella-Roman (third from right) was at a clinical facility in Mysore, India, to test the performance of a device to detect cervical cancer. An engineer in the College of Engineering & Computing has pioneered an easy-to-use imaging system for the diagnosis of cervical cancer, which is potentially life changing for many women with little or no access to specialized health care. Jessica Ramella-Roman, associate professor in the Department of Biomedical Engineering, and her team of graduate students developed a cost-effective, hand-held device that uses optical technologies to detect subtle changes in cervical tissue that may indicate early stage cancer. The device works like a camera, and the imaging is done through a speculum, a tool used for dilation. The imaging takes less than five seconds to complete. Cervical cancer is the fourth most common cancer in women worldwide, and 80 percent of these deaths are from developing countries that lack effective screening programs. Like all cancers, early detection and diligent monitoring increase patients’ chances for successful treatment. This easy-to-use imaging system for the diagnosis of cervical cancer is potentially life changing for many women with little or no access to specialized health care. Both clinicians and researchers have used optical technologies in cervical cancer detection devices for use in poor, remote areas before. However, limitations such as poor health care infrastructures and a lack of pathologists have restricted their success. In India, people have very limited access to hospitals or health care providers in rural areas. With no real program for annual checkups, the only access women have to medical care is typically one exam over her lifetime. Using Mueller Matrix imaging, a tool that uses polarized light to highlight small changes in cervical tissue that are typical of this disease, Ramella-Roman’s device can be used by a person with limited training. The device works as easy as taking a photo with a camera. The complexity of the device is in analysis of the data, which is done by software. The software’s response notifies the patient’s risk of cervical cancer in a localized area of the body. To test the system, Ramella-Roman collaborated with Madhivanan, who is also the director of the Public Health Research Institute of India (PHRII) in Mysore, India. 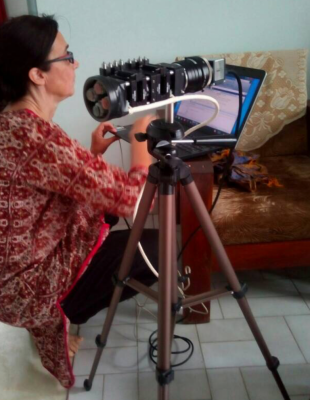 Jessica Ramella-Roman sets up the imaging device for use in Mysore, India. The duo traveled together to Mysore where they screened a group of 23 volunteers in health camps in the surrounding area of Mysore and the PHRII clinical facility to test the performance of the device for detection of cervical cancer. These camps are hospitals created by the non-profit organization, where physicians are brought in to provide yearlong care and also have the capabilities of administering these cervical exams. “Going to India and witnessing first-hand the medical needs of this underserved community has been life-changing. I look forward to working with Dr. Madhivanan in the future to bring our modalities from the bench to bedside,” said Ramella-Roman. While in India, the device’s ease of use was rigorously tested. The vast majority of practitioners and patients were interested in the imaging procedure, which ultimately could speed up the diagnostic process. It is hard to train the naked eye to spot suspicious regions, especially in the early stages. Although there are alternative ways to test, such as smearing acidic acid on the cervix, this device is helping health care providers to be more effective in their testing. Providing this examination creates an image with high contrast that highlights where they think the cancer is. The physician or health care provider can then go and test the specific region, guiding them to take a swab of the specific area, or even remove the suspicious area. The current process is minimally selective. Health care providers use a swab to collect samples from multiple regions in the cervix. With this device, they can examine a more targeted area, and provide them with a better visual, and a better assessment of suspicious regions. Researchers are currently testing the device in the field on patients with cervical cancer to determine how well the device works, and to test the advantages and limitations of the current imaging modality.